Dan appeared on Good Morning America, Tuesday, March 11th to discuss the latest happenings on the Oscar Pistorius trial. Pistorius is on trial for the muder of his girlfriend, Reeva Steenkamp. Pistorius claims he believed Steenkamp to be an intruder when he shot her through the bathroom door. Pistorius also claims the couple went to bed harmoniously at 10:00 P.M. that night but a pathology report is showing that Steenkamp ate about two hours before her death which would have been around 1:00 AM. Says Dan, “Previously we expected this issue of did he have his prosthetic legs on would become crucial and the angle of the bullets and all that would become a key issue to show premeditation. We thought the prosecution would say he put on his prosthetics that would have taken time, that’s premeditation. They’ve now abandoned that theory so we thought the pathologist would become a little less important but there’s that other issue and that is what time did she last eat? Why is that so crucial in a case like this? 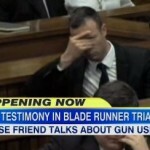 Because if he is saying they went to sleep at 10:00 P.M. , and you have these other witnesses, these ear-witnesses hearing an argument, her eating later in conjunction with these ear and eyewitnesses saying that they heard an argument, could be devastating for Pistorius’ defense.” Watch the full clip here.